File Types: EPS,JPG,All Files; File Size: 988.05 KB; Requirements: Adobe CS1+; Vector: Yes. Businessman broker trying to gain short profits on falling market. 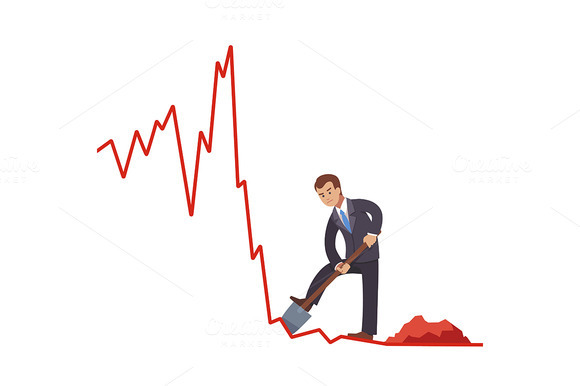 Digging cash with shovel on declining market shares on line graph. Market crisis concept. Flat style vector illustration clipart. Keywords: flat, icon, vector, object, isolated, illustration, template, background, design, cartoon, metaphor, clipart, concept, business, man, people, person, businessman, biz, office, worker, employee, clerk, manager, management, executive, consultant, lawyer, professional, suit, white, collar, decline, crisis, line, graph, chart, graphic, dig, digging, mine, undermining, mining, shovel, upward, statistics, bar, down, fall, gain, loss, manipulation, market, stock, broker, bear, percent, short, risk, cutting, losses, pile, rate, investor, investment, success, lose, economy, minimal, smart, ore, extraction, digger, win.